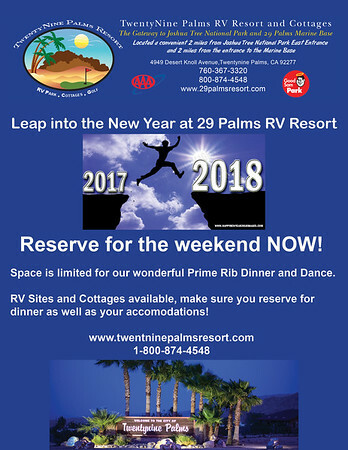 29 Palms RV Resort: Christmas Party - Hot Buttered Rum and Gifts - Oh My! 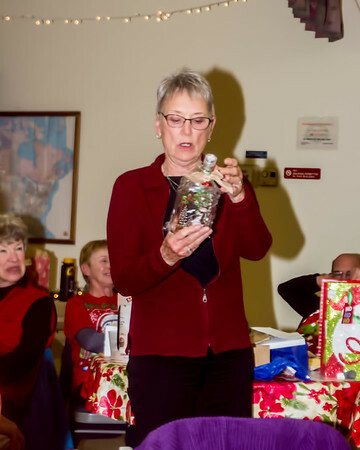 Christmas Party - Hot Buttered Rum and Gifts - Oh My! 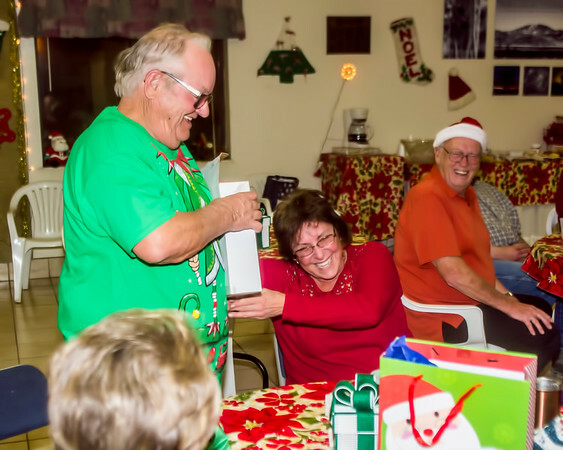 Last night was our annual Park Christmas Party and Gift Exchange at Twentynine Palms RV Resort! 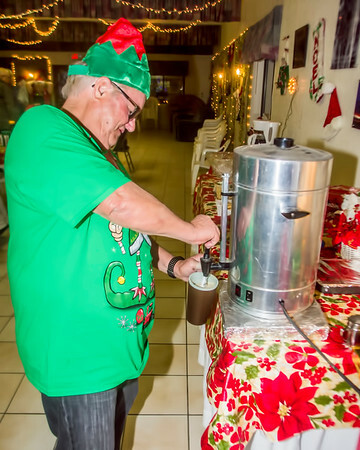 The Hot Buttered Rum was flowing and the crowd was in a Festive Holiday Mood! 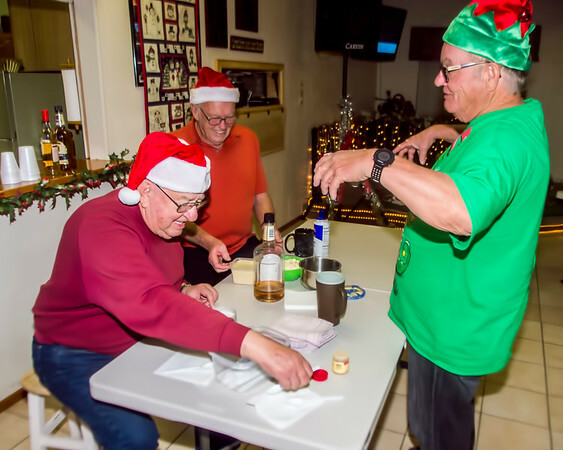 The bartenders were kept busy...and at least two tables were really festive! 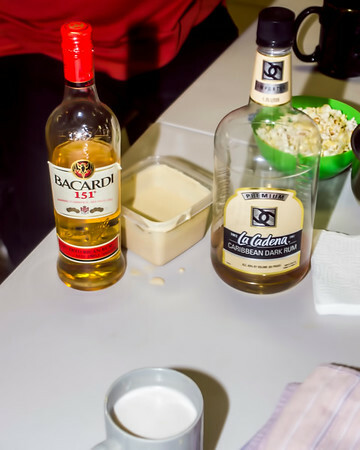 A little buttered rum mix, some rum and a little hot water! After the cocktails slowed down a little, we had a wonderful chili feed - everyone brings a can of their favorite chili it all goes in the cooker and is surprisingly good, always toppings of onions, cheese, jalapenos, crackers etc...a fun and easy meal for our party! After dinner the fun and gift exchange begins...everyone brings a gift, male, female or unisex - $10.00 max - name goes in a hat, the first person to get their name drawn selects a gift, then the next person draws a name and selects a gift or one of the preceeding gifts and gives the unopened to the person with the one they exchanged. At the very end the first person then can exchange their gift with any of the ones after! 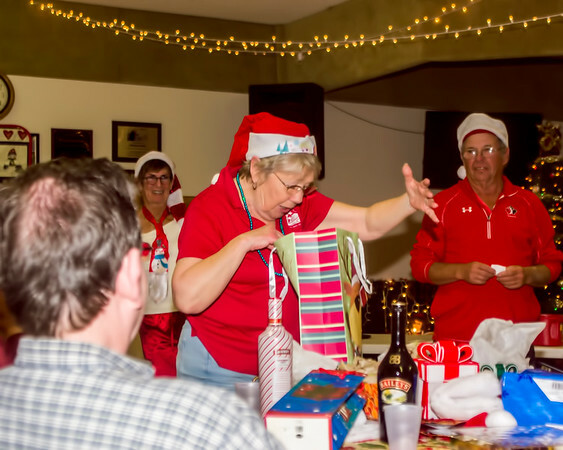 Lots of fun with the good gifts moving from person to person with cheers and jeers! We had a nice crowd! The exchange begins and Jim Stevens was the lucky first name drawn so he will get to choose again at the end! 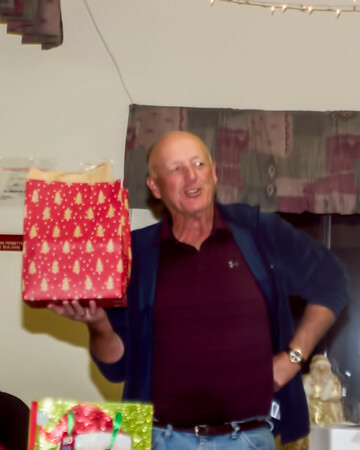 The infamous rechargeable electric drill - this gift made the rounds to numerous people and ended up with Jim Stevens at the end! 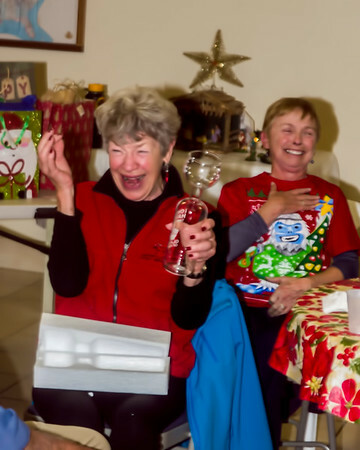 Someone also exchanged Shirley's Wine Glass, big enough to hold a whole bottle!!! 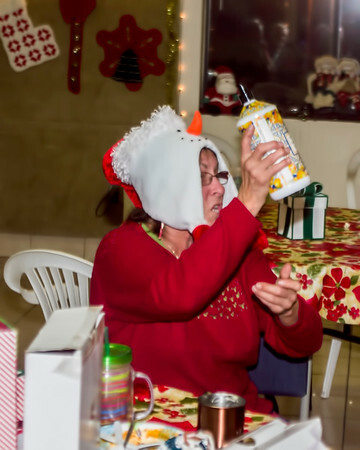 Linda trying to trade some "smelly stuff"!! Always fun and a surprise! Lori says a bottle of Kahlua will be fine! 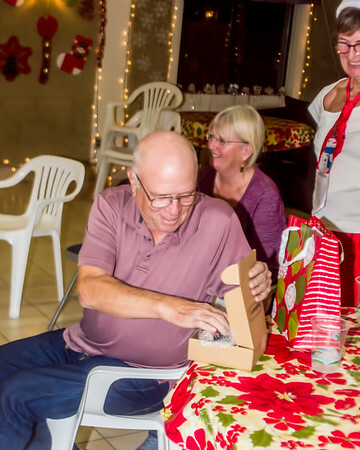 There goes the drill again and Jim gets a ladies gift in exchange! 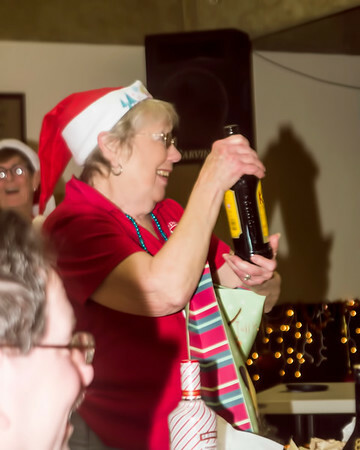 A great time was had by all and plenty of laughs! 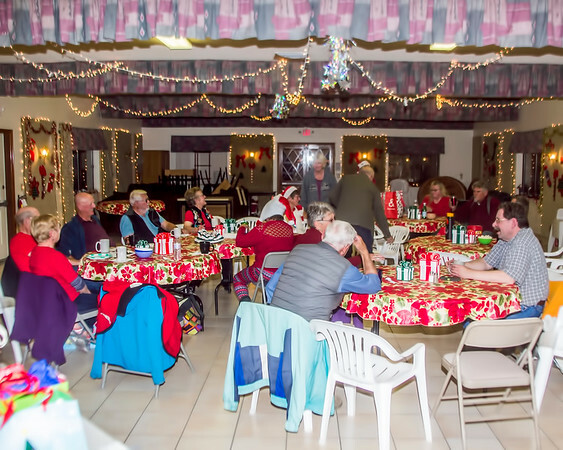 Christmas Potluck Dinner at 2:00 pm on Monday, sign up with what you are bringing on the Clubhouse Bulletin Board, everyone is welcome, Park furnishes Turkeys and Ham! Stay tuned plenty of fun left this holiday and winter season!